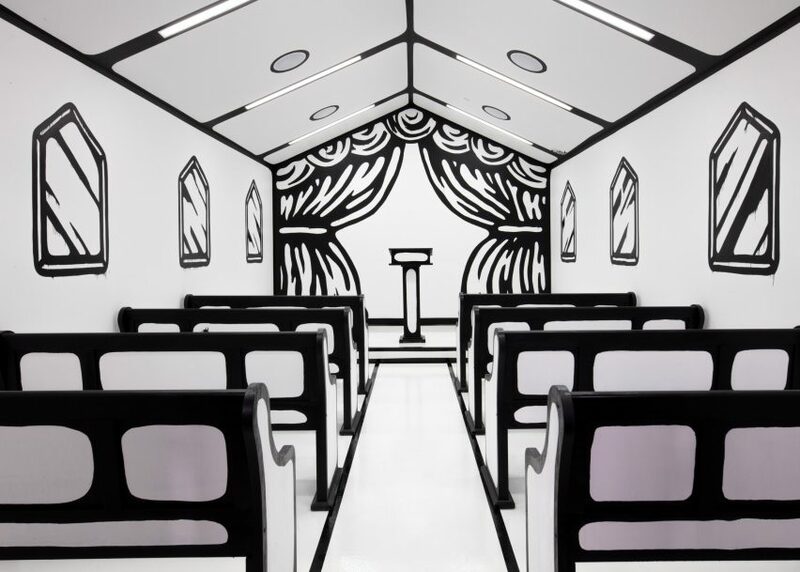 Graphic designer and visual artist Joshua Vides has created a chapel in a Las Vegas hotel, for couples to tie the knot in an "Instagram-worthy" setting. Vides' 800-square-foot (74.3-square-metre) installation is erected at the Palms Casino Resort. From 18 January 2019, it will be available to hire for wedding ceremonies, vow renewals and accompanying photos. The Guatemalan-American designer based the pop-up venue on another venue famed for shotgun weddings in Las Vegas: A Little White Wedding Chapel. His version, however, is detailed using his childlike, illustrative style – intended to create an ideal backdrop for "Instagram-worthy" pictures. The style follows a string of designs that look like 2D-drawings, including furniture that resembles sketches. Vides's chapel, called Til Death Do Us Part, features white surfaces covered in thick black lines that mark out the shapes of four rows of benches, the pulpit and doorways. The markings also form additional decorations, like imaginary windows with reflections, circular spotlights in the pitched ceiling, and curtains. While tongue-in-cheek, Til Death Do Us Part is an example of Instagram's growing influence on architecture and design. Many clients, like hotels and resorts, are now asking for projects to have strong Instagram appeal, according to architect Farshid Moussavi. Guests staying at the Palms Casino Resort can chose from a range of hire packages for Til Death Do Us Part, to set it apart from competitive venues. At $250 (£194), the cheapest offer is named Our Marriage Looks Perfect – On Instagram, which includes an hour in the chapel simply to take photos. The photographer is not included. Next up, for a $500 (£389) price tag is the The Shotgun Wedding, comprising an hour-long ceremony, additional time for photos and a bottle of champagne to celebrate. Black, White and Wed is better suited to those with a bigger party, offering a four-course dinner at either Scotch 80 Prime or Vetri Cucin, beverage packages for up to 24 people, and VIP entry to the APEX Social Club with complimentary admission. The price for this option ranges from $500 to $5,500 (£4,273), depending on the size of the party. Finally, the $4,500 (£3,492) For Better Or For Worse package comprises a one-night stay in the resort's Make Good Choices Suite, where a two-hour reception can take place following the ceremony. Til Death Do Us Part is among a number of chapels that offer unusual settings for weddings. Others include a minimal structure MÁS architecture founders created for their own nuptials and a tiny clifftop venue in Lebanon. Instagram was originally established as an application for editing images, but has grown into a major photo-sharing platform and cultural phenomenon. It has become particularly influential among the architecture and design community, with many exhibitions and events using it to ramp up exposure when captured and shared on the platform. Examples include Colour Factory in New York, Dutch Design Week and Burning Man.